Michael William "Mike" Krzyzewski ( ; nicknamed "Coach K"; born February 13, 1947) is an American basketball coach and former player. Since 1980, he has served as the head men's basketball coach at Duke University after taking over the program from Bill Foster. At Duke, Krzyzewski has led the Blue Devils to five NCAA Championships, 12 Final Fours, 12 ACC regular season titles, and 13 ACC Tournament championships. Krzyzewski is also the coach of the United States men's national basketball team, whom he led to two gold medals at the 2008 Summer Olympics and 2012 Summer Olympics. He was the head coach of the American team that won the gold medals at the 2010 FIBA World Championship and the 2014 FIBA World Championship. He was also an assistant coach for the 1992 "Dream Team". On November 15, 2011, Krzyzewski led Duke to a 74–69 victory over Michigan State at Madison Square Garden to become the coach with the most wins in NCAA Division I men's basketball history. Krzyzewski's 903rd victory set a new record, breaking that held by his former coach, Bob Knight. On January 25, 2015, Duke defeated St. John's, 77–68, again at Madison Square Garden, as Krzyzewski became the first Division I men's basketball coach to reach 1000 wins. Krzyzewski was born in Chicago, Illinois, the son of Polish American, Catholic parents Emily M. (née Pituch) and William Krzyzewski. The family name was originally Krzyżewski (IPA: ), and while the media and general public pronounces it , his own pronunciation is . Raised as a Catholic, Krzyzewski attended St. Helen Catholic School in Ukrainian Village, Chicago and, later, Archbishop Weber High School in Chicago, a Catholic prep school for boys. He graduated from the United States Military Academy at West Point, New York, in 1969, and played basketball under Bob Knight while training to become an officer in the United States Army. He was captain of the Army basketball team in his senior season, 1968–69, leading his team to the National Invitation Tournament (NIT) at Madison Square Garden in New York City, where West Point finished fourth in the tournament. From 1969 to 1974, Krzyzewski served in the United States Army and directed service teams for three years. In 2005 he was presented West Point's Distinguished Graduate Award. Krzyzewski was discharged from active duty in 1974 and started his coaching career as an assistant on Knight's staff with the Indiana Hoosiers during their historic 1974–75 season. 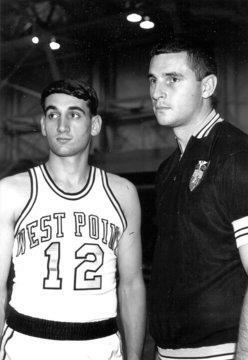 After one year with Indiana, Krzyzewski returned to West Point as head coach of the Army Cadets. He led the Cadets to a 73–59 record and one NIT berth in five seasons. On March 18, 1980, Krzyzewski was named the head coach at Duke University after five seasons at Army. After a few rebuilding seasons, he and the Blue Devils became a fixture on the national basketball scene with 29 NCAA Tournament berths in the past 30 years and 20 consecutive from 1996 to 2015, which is the second-longest current streak of tournament appearances behind Kansas, which has appeared in the tournament in 26 consecutive seasons. Overall, he has taken his program to postseason play in 31 of his 34 years at Duke and is the most winning active coach in men's NCAA Tournament play with an 86–25 record for a .767 winning percentage. His Duke teams have won 13 ACC Championships, been to 12 Final Fours, and won five NCAA tournament National Championships. On February 13, 2010, Krzyzewski coached in his 1000th game as the Duke head coach. On March 20, 2011, Krzyzewski won his 900th game, becoming the second of three Division I men's basketball coaches to reach 900 basketball wins, the other two being Jim Boeheim at Syracuse and his head coach at Army, Bob Knight. On November 15, 2011, Krzyzewski got his 903rd win passing Knight's record for most Division I wins. In an interview of both men on ESPN the previous night, Krzyzewski discussed the leadership skills he learned from Knight and the United States Military Academy. Knight credited Krzyzewski's understanding of himself and his players as keys to his success over the years. On January 25, 2014 Krzyzewski won his 900th game with the Duke Blue Devils, making him the second head coach to win 900 games with one NCAA Division I men's basketball program. On January 25, 2015, Krzyzewski won his 1000th game against St. John's University in Madison Square Garden. He is the first men's coach to win 1,000 NCAA D1 basketball games. On April 6, 2015, Krzyzewski won his 5th NCAA championship against Wisconsin. Krzyzewski has been the head coach of several USA men's national teams, winning a silver medal at the 1987 World University Games, a bronze medal at the 1990 FIBA World Championship, a silver medal at the 1990 Goodwill Games, a bronze medal at the 2006 FIBA World Championship, and gold medals at the 2007 FIBA Americas Championship, the 2010 FIBA World Championship and the 2014 FIBA World Cup, and repeat gold medals at the 2008 Summer Olympics and 2012 Summer Olympics. He was also an assistant coach to the USA teams which won gold medals at the 1984 and 1992 Olympics as well as the 1979 Pan American Games Team and 1992 Tournament of the Americas. In 2005, he was appointed coach of the national team through the Beijing Olympics. In the 2006 FIBA World Championship, the USA won the bronze medal after losing in the semifinals to Greece and then beating defending Olympic gold medalist Argentina for third place. On August 24, 2008, Krzyzewski's U.S. team won the gold medal at the 2008 Beijing Olympic Games. "The Redeem Team" finished the tournament with a perfect 8–0 record. He coached the U.S. team for the 2010 FIBA World Championship and led Team USA to a perfect 9-0 record, defeating host Turkey in the gold medal game, 81–64. His team won a second Olympic gold in London, defeating runners-up Spain 107-100. Krzyzewski has amassed a total record of 75–1 (.987) as head coach of the USA National Team. In February 2013, Krzyzewski initially stepped down after seven years of coaching the national team, but Team USA in May announced that he would return as head coach from 2013 through 2016. During his long tenure at Duke, Krzyzewski has been given the opportunity to coach in the NBA at least five times. The first time came after the 1990 season when he led the Blue Devils to their third straight Final Four appearance. The Boston Celtics offered a coaching position to Krzyzewski, but he soon declined their offer. The next season, Krzyzewski proceeded to lead the Blue Devils to the first of two straight national championships. In 1994, he was pursued by the Portland Trail Blazers, but again he chose to stay with Duke. In 2004, Krzyzewski was also interviewed by the Los Angeles Lakers following the departure of high-profile coach Phil Jackson. He was given a formal offer from Lakers general manager Mitch Kupchak, reportedly for five years, $40 million and part ownership, but again turned down the NBA. In 2010, the New Jersey Nets were reportedly willing to pay Krzyzewski between $12 million and $15 million per season to coach the Nets. Krzyzewski again declined the offer and stayed at Duke. In 2011, Krzyzewski was offered the vacant coaching position for the Minnesota Timberwolves, but he again declined the offer and chose to stay at Duke. Two-time United States Sports Academy Amos Alonzo Stagg Coaching Award winner - 1991, 2008. 2011: Sports Illustrated "Sportsman of the Year"
Basketball court at Cameron Indoor Stadium named "Coach K Court"
Award presented at the United States Military Academy named the "Coach Krzyzewski Teaching Character Through Sports Award"
Three former players— Jeff Capel, Nate James, and Jon Scheyer—currently work under Krzyzewski as assistants at Duke. Krzyzewski has also coached NBA general managers: Danny Ferry, of the Atlanta Hawks, and Billy King, of the Brooklyn Nets. Former player and captain Chip Engelland has served as assistant coach and shooting specialist to the San Antonio Spurs since 2005, Bob Bender is an assistant coach for the Atlanta Hawks, Greg Paulus is assistant coach for the Ohio State Buckeyes and Chris Carrawell, is an assistant coach under Steve Wojciechowski at Marquette University. In Duke's 2013–14 ACC season opening 79–77 loss against Notre Dame, Krzyzewski endured his first loss to one of his former assistant coaches (Mike Brey) after 18 wins. Krzyzewski married his wife, Carol "Mickie" Marsh, in the Catholic chapel at West Point on the day of his graduation in 1969. They have three daughters and nine grandchildren. Krzyzewski and his family founded the Emily Krzyzewski Center, a non-profit organization in Durham, which was established in 2006 and named in honor of Krzyzewski's mother. The mission is to inspire students from kindergarten to high school to dream big, act with character and purpose, and reach their potential as leaders in their community. The Center's K to College Model serves academically-focused students in out-of-school programming designed to help them achieve in school, gain entry to college, and break the cycle of poverty in their families. Krzyzewski and his wife, Mickie, have also been active for years in fundraising and support for the Duke Children's Hospital, Children's Miracle Network, the V Foundation for Cancer Research. In all of those entities they have both served as chairs and/or led major fundraising efforts. In addition, the Krzyzewskis have been major donors to Duke University in supporting a number of areas, including establishing scholarship endowments for students in North and South Carolina as well as a Duke student-athlete every year. In 2012, Krzyzewski received the U.S. Basketball Writers Association's Wayman Tisdale Humanitarian Award honoring his civic service and charitable efforts in making a significant positive impact on society. Krzyzewski participated in Troopathon 2013. ^ a b c Krzyzewski coached only the first 12 games of season before leaving the team for back surgery and to recover from exhaustion. Pete Gaudet took over as interim head coach and compiled a record of 4–15 with a mark of 2–13 in conference play. Duke finished the season with a record of 13–18 overall and in ninth place in the ACC at 2–14. Duke credits the first 12 games of the season to Krzyzewski and the final 19 games to Gaudet. ^ Coach K: Duke Basketball. Accessed on February 18, 2008. ^ Phillips, Scott (January 25, 2015). "Coach K earns career win No. 1,000 in No. 5 Duke's win over St. John's". NBC Sports. Retrieved 25 January 2015. 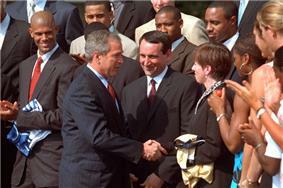 ^ "Krzyzewski Receives 2007 Ellis Island Family Heritage Award - Duke University Blue Devils | Official Athletics Site". GoDuke.com. Retrieved 2012-08-04. ^ a b Susan Hines-Brigger, "Mike Krzyzewski: Life Beyond the Rim", St. Anthony Messenger, March 2006. ^ "2005 Distinguished Graduate Award". West Point Association of Graduates. Retrieved 2009-06-05. ^ "Duke Names Krzyzewski". news.google.com. Associated Press. 1980-03-19. Retrieved 2015-04-04. ^ "Duke-Michigan Rivalry Renewed With Same Result". ^ Spencer, Sheldon (November 15, 2011). "Coach K, Knight reflect as Duke coach nears career victory No. 903". Front Row. ^ "Duke flushes Florida State to give Coach K his 900th school win". The Associated Press. January 25, 2014. ^ Coach K exits with a golden legacy of greatness. Kansas City Star, August 12, 2012. ^ "'"Mike Krzyzewski: 'It's been an honor. ^ "2013 USA Basketball Men's National Team Mini-Camp" (PDF). USA Basketball. p. 6. Archived from the original on June 14, 2014. ^ Tjarks, Jonathan (2012-03-12). "NBA News, Rumors, NCAA Basketball, Euroleague". RealGM. Retrieved 2012-08-04. ^ Coach K" Headlines Army Hall Of Fame Class Of 2009""". GoArmySports.om. Retrieved 16 Sep 2009. ^ "Six receive Krzyzewski Character through sports award" (PDF). Pointer View. Retrieved 16 Sep 2009. ^ "Alabama football coach Nick Saban coming to Daphne to accept Amos Alonzo Stagg Coach of the Year Award | al.com". Blog.al.com. Retrieved 2012-08-04. ^ "Amos Alonzo Stagg Coaching Award". ASAMA - The American Sport Art Museum and Archives. Retrieved 6 Oct 2012. ^ "Notes: Notre Dame 79, Duke 77". GoDuke.com. 2014-01-04. Retrieved 2014-01-05. ^ Sports Illustrated, March 16, 1992. ^ "2006-07 ACC Men's Basketball Media Guide" (PDF) (Press release). theACC.com. Retrieved 2008-03-22.